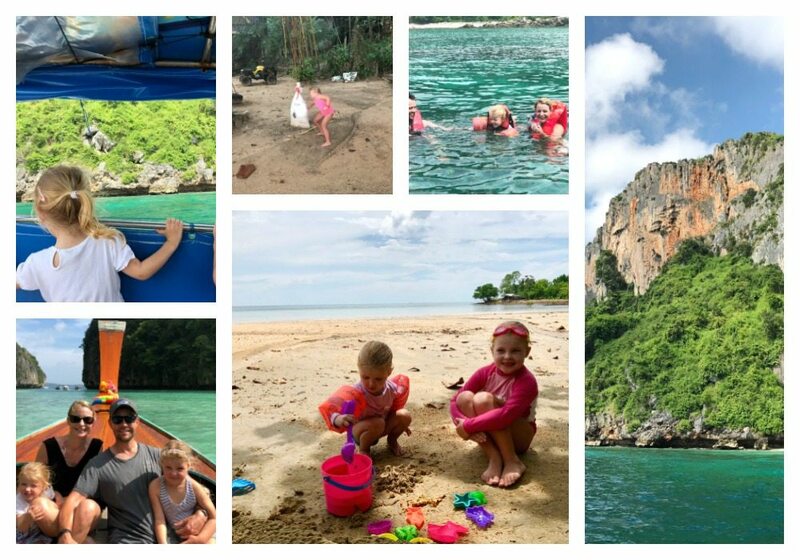 We recently returned from the lesser travelled path of Krabi and then onwards to the more remote, beautiful island of Koh Jum with kids – our then 2 and 5 year old. October half term meant that we visited at the tail end of the green season when showers are expected. However, in 21 days, we only had a couple of afternoons where we huddled up inside, listening the rain pour onto the ocean and bring the humidity down a notch. If you are wondering whether it is worth taking little ones, including a toddler on a 14 hour flight, then transit onto another short flight to Krabi, followed by a drive and a narrowboat ride to Koh Jum – I would say a big fat YES in a heartbeat! Thailand has to be one of my all time favourite places to holiday. 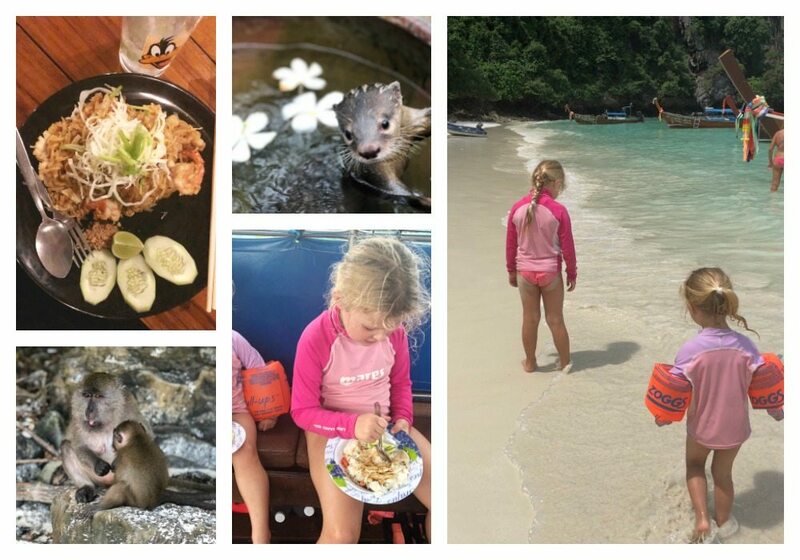 With wonderful food, the most beautiful scenery, sandy beaches, spectacular snorkelling & diving with all year round warmth, Koh Jum island has something to offer all the family. 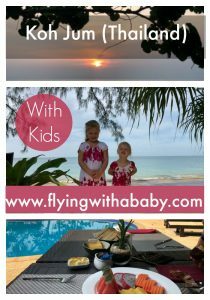 Here’s my family guide to Koh Jum island, with suggestions of where to go, what to do and where to stay. Where is Koh Jum Island? Koh Jum Island (also known as Ko Pu) is only an hour away from Krabi airport and a 30 minute longboat ride from the Krabi mainland. Koh Jum (Krabi Province) is easily accessible from Krabi and there are daily long-tail taxi boats going to and from to the main land – Krabi. It’s remote in terms of being off the traditional tourist trail, but therein lies its beauty. Not a 7/11 in sight and a place where the ‘land of smiles’ comes into its own. I have visited several areas of Thailand, and it’s here, on this idyllic island where I have met the most genuine and friendly locals. Mass tourism has yet to arrive and instead you will find beautiful beaches, a couple of villages, and accommodation for all budgets. Koh Jum is easily accessible from Krabi and there are daily long-tail taxi boats going to and from to the main land Krabi. Koh Lanta and Phi Phi are a short boat ride away. Quite a few places do close down during the green or rainy season, but a handful of places do remain open. 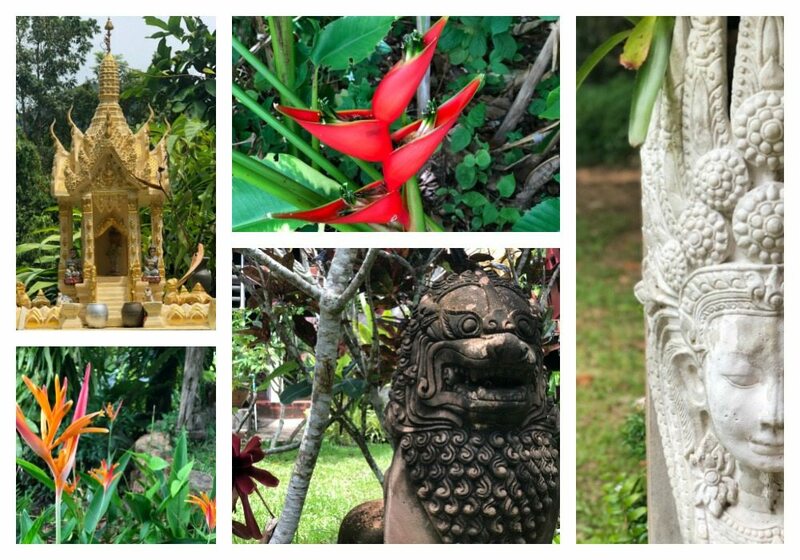 We visited during October and November – towards the end of the green season and found plenty of places open, including local shops on Koh Jum village, a couple of beach bars/restaurants etc. We had no problem organising a private boat trip either. Rustic or luxury? We stayed in both whilst there. 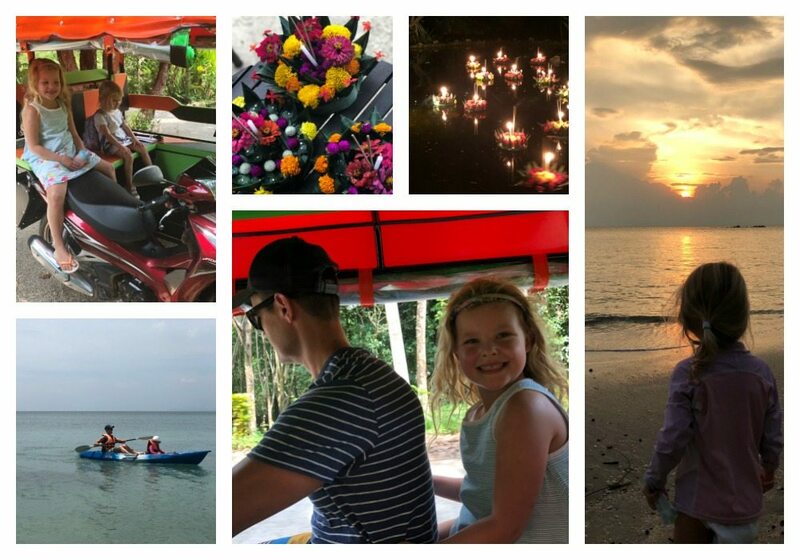 Below are our thoughts on two different Koh Jum accommodation choices. There are no large hotels on Koh Jum. We first stayed in the northern part of the island, close to the lush and dense green forests, but right on the beach. Our longboat navigated the few rocks into the sand where the lovely Kwan and her family welcomed us to Piman Pu on Lubo Bay. 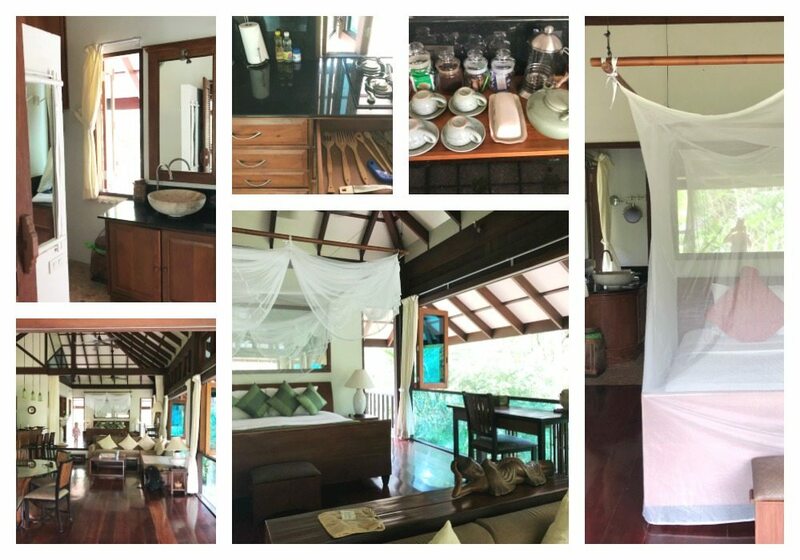 Piman Pu Villa is a rustic, recently constructed traditional Thai home set in a lush green tropical garden – if you are lucky you may spot a shy monitor lizard. Much of the wood was salvaged from the tsunami and lovingly turned into a peaceful retreat. The villa has a fully equipped kitchen with modern facilities, including TV, DVD’s, free WiFi and a private pool just a 1 minute walk from the beach. The main bathroom comes with hot shower facilities and a separate loo and wash basin. This rustic villa has steep stairs to the upstairs bedrooms (x2 double beds) but our 2 year old managed these perfectly. As is common in Thailand, beds are harder than we are used to, but we all slept well. Meals can be prepared with food purchased by guests at no additional charge. Kwan, the amazing housekeeper and her family live just behind the property. Kwan will ask you what meals you will like and prepare them for you. You simply settle up the food bill directly to her at the end. Her Thai dishes are naturally wonderful and her omelettes and pancakes went down a treat. Kwan very kindly washed some laundry for us too. A popular request from my girls was to see her pet otter. A very friendly little chap, who loved dipping in an out of a large flower pot filled with water! The villa has a local information book and Kwan is also a fountain of knowledge. We hired our long tail boat pilot for a day trip around the islands. We visited several, including Phi Phi and snorkelled in the vincinity, but we only disembarked on Monkey Island. Money island is an absolute must. the sand is literally as soft and as fine as flour but almost white in colour. Wild monkeys gamble across the beach, providing plenty of photo opportunities! The gentle slope of the beach, makes it perfect for toddlers or new swimmers too. You can hire bikes or hike too if you wish. There are a couple of places to eat a few metres up the beach (Boa Hut is one) and there is also a massage place on the beach too. One of the shabby chic bars has a little swing, and a punch bag to practise your Thai boxing skills. It is a remote place, our next place was closer to the main village, but if some downtime, peace and quiet and a digital detox are what you are looking for – then this is the place. 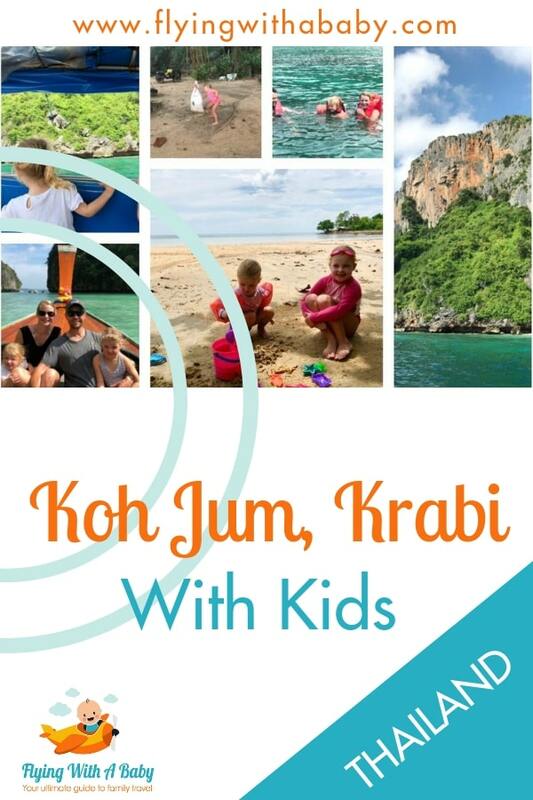 Interestingly, out of the 3 places we stayed, the Holiday Inn Resort Krabi with water slides, Piman Pu and the luxury Koh Jum Beach Villas, this was our eldest’s favourite place. Sometimes a bucket and spade, a pool and a otter are all you need! For latest prices for the Piman Pu Villa – see here. The pilot of our boat (ours was called Nick) prepared a tasty Thai meal for us onboard, with fresh pineapple for dessert and plenty of cold water. All the leftovers were thrown overboard to attract the fish. Such a stunning view to see, even if you don’t snorkel or dive! Life jackets and snorkel equipment are provided. Koh Jum Beach Villas describe themselves as “a luxury eco chic beach villa hideout”, which perfectly describes this gem of a place. There is a huge emphasis on sustainability, and indeed much of the resort has been built using trees uprooted from the tsunami. Koh Jum Beach Villas are in the southern part of the island, close to the main village of Koh Jum. Guests can choose from a selection of twenty luxury beach villas either located on the beach or secluded in lush tropical gardens with stunning sunset views towards the sea, with or without a private pool and up to five bedrooms. All the villas have private gardens too. 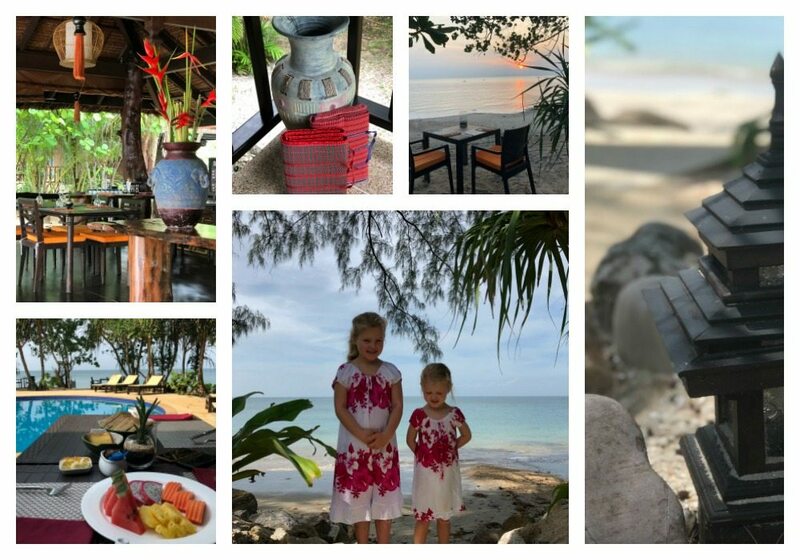 We stayed in Baan Nest, which was absolutely perfect for our family of four. A warm welcome of cool towels and refreshing fruit cocktails greeted us as we docked on the beach after a short long tail boat ride from the north. The villas have air-conditioned areas, and numerous fans to cool down. Windows open in a way which can make you feel like you are outside camping but in complete luxury, with a huge comfortable, cosy bed. Natural mosquito spray is provided as well as incense coils- which is needed as the sun sets into a magnificent hue of red, pinks and oranges. The living area has tasteful furniture and fittings which ooze charm and sophistication but are totally in keeping with the natural surroundings. The kitchen is fully equipped with a fridge, freezer, hob, microwave, kettle plus all utensils. A chef can even come and teach you how to cook a Thai meal in your villa. Bathrobes and hairdryers are provided and onsite wifi too. There is one restaurant onsite, which provides delicious meals all day as well as speciality food nights on selected days of the week. A bar with light snacks provide delicious cocktails too! Just opposite is a communal pool which overlooks the beach and is the setting for evening entertainment including a fire performer! We also met there to prepare flower boats for the traditional Thai festival of Loi Krathong – it was a lovely way for guests to understand local traditions. For the latest prices for the Koh Jum Beach Villas, see here. You can hire a tuk-tuk or bike from Koh Jum Beach Villas to explore the local area – Koh Jum Village is about a 15 minute tuk-tuk ride away. Further activates include kayaking through the mangroves, trekking through the flora and fauna, snorkelling, exploring the island. (Phi Phi is 30 minutes away by speed boat), diving, volleyball, golf, rock climbing, cooking class, massages, This was our final stop after nearly 3 weeks in Thailand so we opted for a massage, kayaking, hiring a tuk-tuk into the village and hanging out by the pool and beach. Some days we only saw one other family! 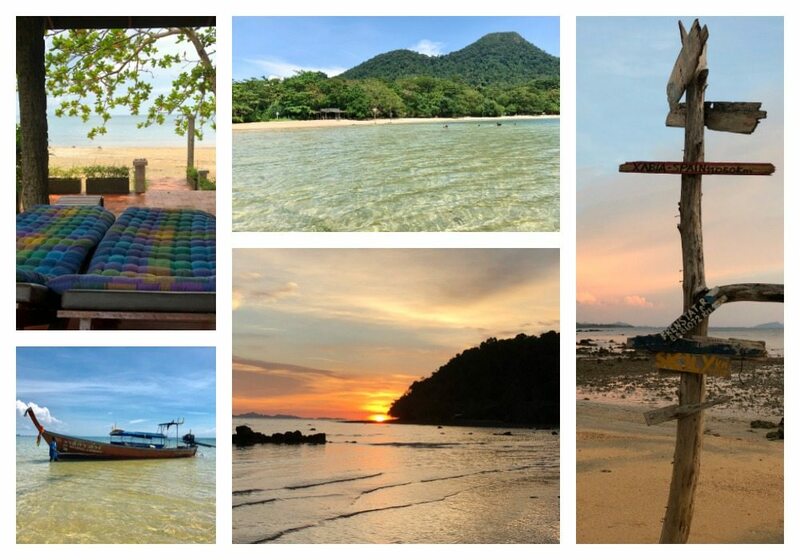 What’s your favourite Thai island?